It is Speedy Tuesday today and I realized that we lacked putting the spot light on the very first Speedmaster model. This first Omega Speedmaster 2915, officially reference CK2915, was designed by Claude Baillod when he was working in the team of Head of Creation Pierre Moinat. The high contrast dial was inspired by Italian race cars of that time, also explaining the very first advertisements of the Omega Speedmaster 2915, showing two sports car enthusiasts and their Speedmaster. As you can see, this Speedmaster is – of course – close family to the current Speedmaster models, but has some differences. The bezel is stainless steel instead of the black aluminum inlay and the dial has broad arrow hands instead of the later white baton hands. The case stayed more or less the same till 1963, with its straight lugs and lack of a crown guard. 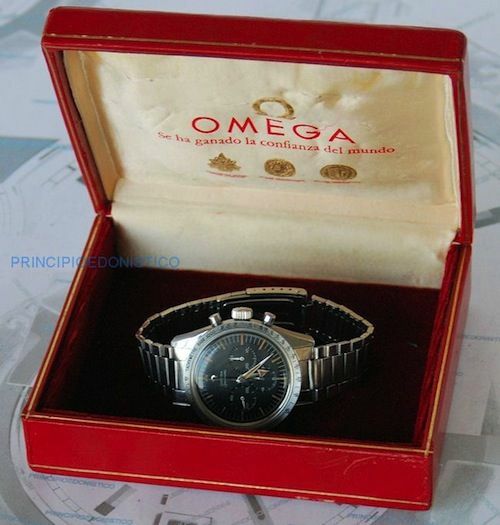 Omega chose the Lemania based caliber 321 chronochraph movement for this watch and did so until 1968. The caliber 861 movement that was used from that moment on, was designed by the same man as the caliber 321 movement, Albert Piguet. The two photos above were taken by me at the Omega Museum in Biel in 2011. 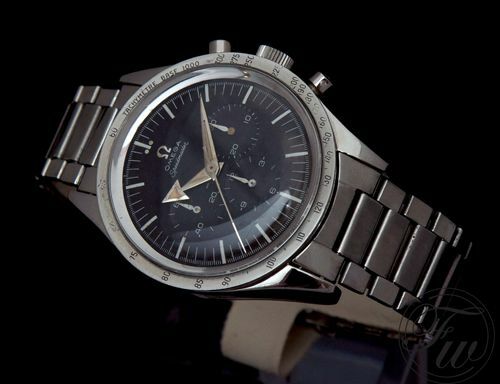 You will rarely see these very first Omega Speedmaster 2915 models, let alone for sale. 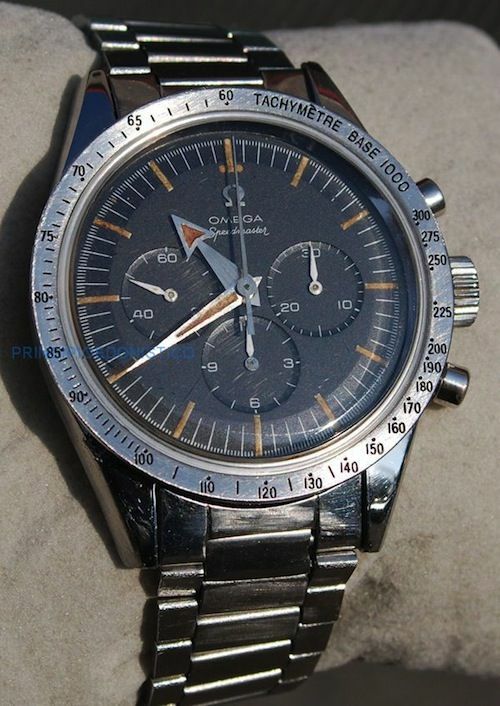 About half a year ago, I showed you this nice condition Omega Speedmaster 2915-2 for auction at Dr. H. Crott in Germany with an estimate of 45-65K Euro (click here for the article). Browsing Chrono24, we found two CK 2915s for sale actually. One of them is shown below. It is a CK2915-2 from 1958 and appears to be in worn but original condition. The seller from Italy asks 32.800 Euro (approx $41,500.- USD) and comes with box and Extract of the Archives. The Extract and the box (without original papers) probably don’t generate any extra economic value to the watch, but are nice to have. 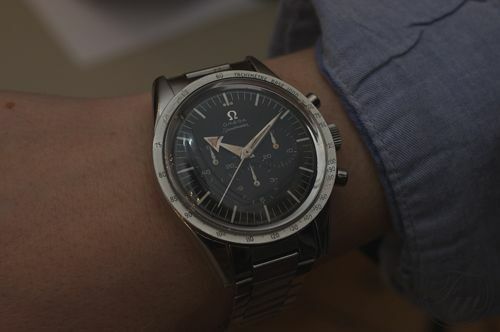 This 39mm straight-lugged case is a beauty and I can understand why Omega decided to bring out a new Speedmaster timepiece who has the same shaped case (click here for our view on the Speedmaster ‘1962’ they introduced this year). The brown discolored dials and hour markers and slight patina on the dial seem to belong together. The case and bracelet also match, as it comes on the very rare reference 7077 bracelet. The very first Speedmaster bracelet that is the predecessor of the later (and expensive) 1039 bracelet that everyone seems to want for their vintage pre-Moon Speedmaster. 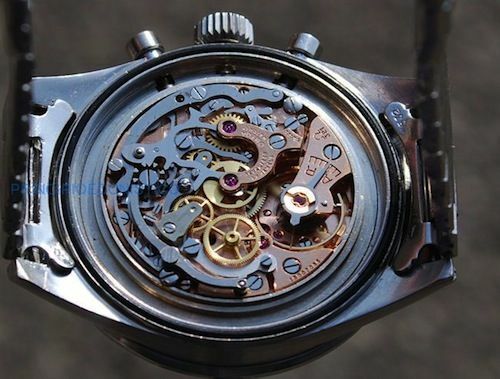 As written above, the caliber 321 movement – based on Lemania – was in the Speedmaster for nearly 11 years. Word is, that this column wheel chronograph was in the end quite expensive to produce. The newer Lemania based caliber 861 also had a higher beat movement (21,600 bph instead of 18,000 bph) which would be better again for accuracy. However, purists prefer the caliber 321 movement. 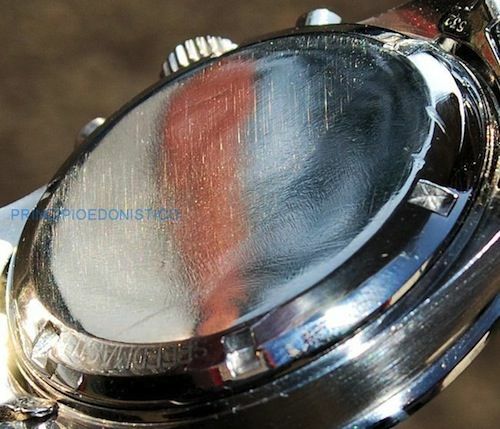 Although the case back shows its original ‘Speedmaster’ engraving, it seems to lack the Seamaster logo. The case has probably been polished in its life time of almost 60 years. More information about this particular watch can be found at principioedonistico.it and here.